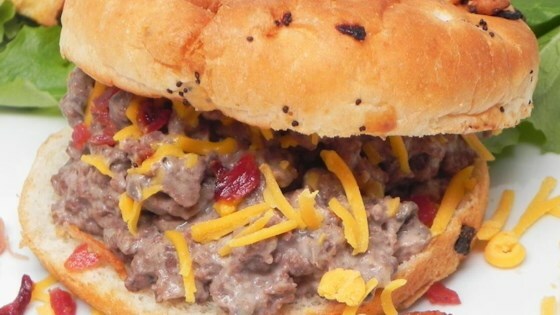 "My mom used to make this variation of sloppy joes, which our family preferred. It is not for the health conscious, but it is very good. It can be eaten on bread as sandwiches, or served over rice. Top with sour cream or French onion dip. The French onion dip is good if you want a little more zip to it. It is actually even better the second day." Cook the bacon in a skillet over medium heat until brown. Drain on paper towels and set aside. Cook the ground chuck in the same skillet over medium heat until no longer pink. Drain and return the ground chuck to the skillet. Stir in bacon, cream of mushroom soup, and American cheese until cheese has melted; serve immediately. Watch how to make this delicious cafeteria classic from scratch. Great recipe for the leftover stuff. It tastes just like it sounds it would. If you like food that goes a long way "cost wise", this is it. Sorry to say, but not very good at all. No real flavor and very heavy.